It seems everyone has ideas about who they are. Then our behavior tells us, “Maybe you’re not that,” and we’re disappointed in ourselves. Maybe embarrassed. All of us are subject to occasional, unseemly outbursts, bad moods, and negative emotions like anger, greed, cowardice, jealousy, and resentment. Sometimes they cause us to do things we don’t intend to do—or keep from doing things we want to do, and we regret them. Sometimes we tell lies— little white ones and big ones too. Our appetites seem to have a will of their own, and not just for food. Yet, if asked about our values, we claim many of the virtues, like generosity, kindness, patience, and fairness, and get all huffy if told that’s not how we’re behaving. These situations can undermine our feelings of integrity and make us unhappy with ourselves. The purpose of this book is to help you act from choice—to make and follow through with choices that reflect your intentions. The foundational choice is whether to act according to your intentions or let your emotional and mindless impulses turn into actions that violate your values. Years of study, work with coaching clients, observation of colleagues and friends, and personal experience have convinced me that we’re defined by the values and behaviors we consciously choose to manifest, so long as we’re trying to act accordingly. I mean that in spite of our unwanted thoughts and behaviors, we actually are who we choose to be if we’re really working at it. For me that means making a real effort to restrain unwanted impulses, and continuing to feel dismayed when they break through, leading to actions that contradict our values and intentions. Ultimately, how we are is the measure of who we are. But I believe that any assessment of how we are must take into account the effort we make to be how we mean to be. Self-management seems a challenge for almost everyone. How about you? I guess that you may have picked up this book because you’re frustrated by some inability to manage yourself consistently, and you want to do better. Act from Choice will give you tools for managing your emotions, your habits, and yourself so you can be how you mean to be. The tools you’ll find here will help you interrupt unwanted habits and emotions, choose what to do, and act more consistently with your values and intentions rather than give in to unwanted impulses. The phrase to be how you mean to be has specific meaning for me. First the goal is about how you mean to be, not how anyone else thinks you should be. To be refers to the qualities you display when relating to other people, to the situations you face, and to you and your life. It refers to qualities such as patience, discipline, determination, courage, compassion, open-mindedness, and more—whatever you’ve chosen for yourself. Finally, being how you mean to be says there’s a commitment to follow through with your intentions so that you have the right to claim the values you’ve chosen. I use the word mean intentionally. Some are confused by my use of mean rather than want. I interpret want to be an expression of emotion, like desire or aspiration. I feel there’s little commitment implied by want. Mean adds to want or aspiration a commitment to put forth effort in order to achieve what is wanted. My self-management goals are grounded in meaning to live with integrity, which, for me, means that my values, intentions, and actions are consistent with and complementary to each other, and I can trust the promises I make to myself. Of course, your motivations for reading this book may be very different and much more specific. Perhaps you want to relate better with the people who are important to you; to gain better control of a difficult, habitual emotion; to sustain an exercise program; to stick to your diet; or to stop procrastinating. If your goals are about managing behaviors you feel are inconsequential, my comments about values and integrity may seem too grand, and not relevant to your issue. You may question whether dieting, stopping procrastination, and exercising regularly have anything to do with values and integrity. But it turns out that discipline requires motivation, which we can boost by including in our goals explicit understanding of how we want to feel about ourselves. Think of a time when you did something that was difficult to do. Remember how proud you felt, and for good reason. The point is that your feelings about success or failure are not abstract. They are also about what you’ve demonstrated about yourself, to yourself. In contrast, if you feel bad when you succumb to temptation and break your diet, procrastinate, or stop exercising, isn’t there an underlying feeling that you’re not as good or as disciplined as you want to be and think you should be? If so, those feelings come from a sense that you haven’t lived up to your standards about how you want to be in the world. I believe we achieve our goals more consistently when we recognize how our performance expresses our values and demonstrates who and how we’ve chosen to be. In Part II, I’ll show you how to use your values to increase your motivation, whether you’re trying to stay on a diet or be more patient with your family. Regardless of how you want to improve your self-management, your behavior and effort are what count. It’s what you do and how you work at being the person you mean to be that’s important. No good purpose is served in claiming to be kind, compassionate, generous, or disciplined if you’re habitually unkind, judgmental, stingy, or unreliable, and you aren’t doing something about it. As you’ll discover from reading this book, many obstacles stand between each of us and being how we mean to be, the biggest of which are internally generated. It’s impossible to act perfectly all the time. But making the effort to improve and manage oneself should count for a great deal. Better performance can be a source of great satisfaction, reinforcing feelings that we are who we mean to be at root, even though we sometimes fail. intend to act or think a certain way, but you don’t. Your behavior and the results are regrettable, though not all the time by any means. Most of the time, you’re a master of self-management. But there are times when you fail. You keep trying not to react the way you do, and you make some progress, but still you continue to embarrass yourself by what you say, do, or find yourself thinking. You may have thoughts and attitudes that embarrass you, even though no one but you knows about them—prejudice, hatred, and lust are favorites. Maybe you wonder how you can be who you think you are, harbor such thoughts, and be so unable to follow through with your intentions. Maybe you accuse yourself of being weak, a phony, or of not trying hard enough. It’s natural to want to be able to manage yourself, but self-management is unnatural. It’s harder than we think it should be because it’s not only about you. There are two actors involved: you and your subconscious. Regrettable behavior happens when you and your subconscious disagree about what you should do, and yoursubconsciouswinsthebattle. The human subconscious is like a separate being that lives inside us.2 It has its own ideas about how to interpret what’s going on around us and what we should do about it, and does its best to make us do what it thinks is right, never mind what we think. It doesn’t want you trying to manage yourself. For convenience and effect, I and others talk about the subconscious as if it were an independent person, like a so-called homunculus living within us. In fact, as the therapist and author Timothy Stokes writes in this book, What Freud Didn’t Know, we habitually experience automatic processes—scripts, he calls them— that are “activated without purposeful conscious effort and with limited conscious oversight …. when conditions beckon them, not [because] we call upon them.” Moreover, as Stokes observes, the subconscious is not hidden from us because we’ve repressed it, as Freud believed. It’s hidden from us because that’s how our brains are constructed: it’s simply how we’re all made. Part of the subconscious is devoted to looking for threats and opportunities.3 It scans the environment constantly. Its interpretations of what it finds, and its notions of how we should react produce the impulses we feel. Those impulses are right nearly all the time. But sometimes they are not what we would choose, and they produce regrettable consequences when they turn into action. You and everyone else are sure that’s not what happens. You’re probably certain you’re in charge, that you see something, evaluate it, and only then decide what to do—and that’s pretty much what most of the scientific community argued as late as the early 1980s. But the scientific research findings are incontrovertible: the brain perceives, judges, and tries to get you to react before you’re aware of what it (and then you) is reacting to. You need to understand this in order to know what you’re up against when you try to manage your impulses, and it’s only fair to factor those realities in when you find yourself judging yourself. You’ll read about the science describing the influence of the subconscious on your behavior in Part I, Unwanted Habits: What We Do and Why We Keep Doing It. Recent discoveries about the role of the subconscious are so significant and so different from previous understandings and intuitions about behavior that they’ve even sparked renewed debate about free will.6 The scientific research says that the subconscious does what it does independently of consciousness. The decisions the subconscious makes are based on interpretations and automatic reactions that it creates without our input, and then it tries to get us to enforce its decisions. The no free will folks say that if all that is true, the subconscious does it all, and we don’t have free will. But we’ve all experienced becoming aware of unwanted, possibly unsavory, or dangerous impulses and choosing to do something different instead.7 As a result, I’m with those who say that whether or not we have free will, we seem to have at least some free won’t, the ability to block our impulses and decide what to do instead.8 Nevertheless, though we recognize that we can manage our impulses to some degree, we want to be more effective and consistent at doing it. The Act from Choice Method will teach you how. The way it is now, when you wake up to knowing you’re carrying out an unwanted impulse, you may try to exercise free won’t. But often the impulse slips by your awareness, which is your first line of defense, and it isn’t until you’re well into or have even completed the unwanted action that you realize you’re violating your intentions. The impulse may have been about something as minor as wanting to eat the chocolate chip cookie or as significant as wanting to hit someone. What happens then? You try to enforce your better judgment, invoking willpower to resist the impulse. Contrary to conventional wisdom, the amount of willpower you’re able to invoke at any particular moment is not a measure of character. Willpower is like a muscle: it will be weaker than normal right after you’ve used it a lot—making decisions or doing things you resist, or if you’re simply tired. If you try to use it then to battle an unwanted impulse, it may not be strong enough. Or the impulse could be so powerful, and driven by such strong emotions, that no amount of willpower could overcome it. This book will give you tools to deal with those four challenges. Use it like a handbook. It is divided into three parts. In Part I, Unwanted Habits: What We Do and Why We Keep Doing It, I describe how brains produce unwanted reactive impulses automatically and independently, without our involvement. I will show you what you face when you’re trying to manage yourself—specifically, how and why you experience the impulses you do and why they’re so hard to resist. You’ll learn that you had no role in choosing what you react to and how you react, and therefore have no reason to feel guilty or ashamed of your impulses. Of course, that in no way relieves us of responsibility for managing our impulses to keep them from turning into unwanted actions. Part II, How to Act from Choice, describes the Act from Choice Method in a linear, step-by-step fashion. Some readers will want to work with the Method as they read through it the first time. Others will want to skim Part II the first time through, and return to work with it later. The last part of the book, the Resource Companion, contains tools, tips, and ideas for dealing with several specific emotions and situations. Scan its table of contents to find tools that seem relevant to your self-management goals. The Act from Choice Method is a synthesis of practices and ideas from a variety of disciplines and traditions. I’ve added a number of innovations I don’t believe you’ll find elsewhere. There are also some significant changes in emphasis compared to many other approaches to habit management. Though it is now well known that habitual patterns are acquired by the subconscious through happenstance and without input from us, I believe I place more emphasis than others on the consequences of that fact; I believe we are innocent of our impulses and should not feel guilty about having them, as long as we’re trying to manage them. This is important because of the habit (! ), so common in Western cultures, of turning our mistakes and shortcomings into attacks on ourselves. Unwanted impulses are still called sins by many, even when heroic restraint keeps them from turning into action. I believe little is gained by labeling habitual thoughts and impulses acquired through happenstance sin, and that such judgments lead to self-destructive attitudes and denial, making it more difficult to make beneficial changes. Further, such judgments make it harder for each of us to recognize that we are competent, far more than adequate, and worthy of our own respect, dignity, and compassion. As mentioned previously, one of the greatest challenges of self-management is becoming aware of unwanted impulses soon enough to interfere with them before they turn into regrettable actions. You’ve probably experienced the difference between being angry and being aware that you’re angry. That’s the kind of awareness you need to cultivate in order to manage yourself. When you’re aware of your anger, you can judge and manage your actions. When you’re the anger itself, you’re its victim. Think of awareness of your anger or other emotions, attitudes, moods, and biases as a necessary aspect of being present. The traditional approach to learning to be present involves mindfulness practices, usually including sitting meditation. The results of meditation practice are extremely durable and effective at improving one’s general mindfulness. Experienced mindfulness practitioners enjoy many rewards from their practice, including being more present to themselves and others, experiencing less stress, having greater tolerance to stress, and improved mood and equanimity. Even so, many find that their unwanted impulses continue to turn into action without triggering their awareness. The Act from Choice Method introduced in this book uses an approach I call targeted mindfulness. As the name implies, its aim is to train the subconscious to look for and make us aware of specific unwanted impulses soon enough that we can intervene and choose our reactions. The tools that make up the Act from Choice Method are simple to use. They’re effective for people with or without experience with mindfulness practices; they are not time consuming, and they are effective right away. You don’t have to use them for months or even weeks to get significant benefit from them. They are useful on their own, and also as adjuncts to traditional mindfulness practices. The benefits of traditional mindfulness training and practice are truly vast. Targeted mindfulness practices have quite limited and different objectives and are no substitute for a regular meditation practice. Nevertheless, many people, those with and without mindfulness training, will find targeted mindfulness to be effective in helping them become aware of their habitual patterns sooner than they otherwise would—thereby making them more successful at managing unwanted habits. Targeted mindfulness practices rely on the human brain’s innate ability to wake us up and bring us to awareness when something important is happening. But we have to train it so that it knows to do it specifically when we want it to. The main targeted mindfulness technique used in the Act from Choice Method is an imaginary lookout I call a Sentinel. It is an extremely effective technique for calling attention to things we want to be sure to become aware of. You’ll find additional techniques for cultivating awareness in everyday situations in the Resource Companion at the end of this book. They can be very effective whether used as standalone practices for those who have no experience of mindfulness practice, or as informal supplementary practices for experienced mindfulness practitioners. This is a big book, and there’s a lot in it. In fact, it’s three books. Readers will have their own way of approaching it. Not everyone will want to read every word or even go front to back. Some will be fascinated by Part I, which describes the way our brains work, and will want to read every word; others will want to get right to the Act from Choice Method itself, or see what might be of interest in the Resource Companion at the end. Still others will want to pick up parts at random. I say hooray to all of you. It is a handbook. Use it like one. Here are some suggestions about how you might want to approach the book, especially if you like to pick and choose. To get a good sense of the book you could go from this Introduction directly to the Afterword, and then review the Expanded Table of Contents to see what tempts you. To get a sense of Part I read Chapter 12, “Putting It All Together.” In my view, the most important thing to get from Part I is an understanding of how much influence the subconscious has over our impulses and behavior. That view will likely convince you that impulses are created innocently, and we’re up against a lot when we try to manage ourselves. If you want to get high points about how our brains produce unwanted reactions—including our individual reactive styles—you could read Chapters 4, 6, 7, 8, 10, and 11. Read Chapter 13, “Introduction to the Act from Choice Method,” to get just that—an introduction and overview of the Method. To get a good sample of how the Method works, read the first half of Chapter 21, which contains a detailed description of how to work with it. The second half of that chapter is about managing habits of resistance and avoidance, habits like procrastination. If your interest is primarily in targeted mindfulness, discussed earlier in this Introduction, read Chapter 19, “A Is for Awareness,” which discusses the Sentinel in detail and also the technique Ask the Second Question. You might also be interested in some of the material in the Resource Companion at the end of the book, in particular the sections on Slogans, Mantras, and Aphorisms and Developing Awareness. Motivation is essential to effecting changes in behavior and attitudes. Chapter 16, “M Is for Motivation,” could serve as a standalone method for undertaking anything you find difficult or tend to resist doing. Have at this book in any way that suits you. It’s yours. Use it in the way that best serves your interests and needs. Please keep in mind that this book is meant to help readers manage habits that are subclinical. It is not suitable for diagnosing psychological problems or disease. Most important, if your behavior is at all dangerous to yourself or others, if it is so durable and disturbing that it keeps you from feeling fully functional, or if you are addicted to substances or behaviors that interfere with your happiness or livelihood, seek licensed professional help, and rely on their recommendation as to whether you should work with the techniques in this book. My goal is to teach you how to use your insights and innate skills to identify and manage the habits that cause you to do things that run counter to your best intentions and conflict with how you mean to be—habits that make you unhappy with yourself, as a result. There is theory here, but more important, there are techniques—practices you can use to manage yourself and your emotions so you can be how you mean to be. And you work hard at it. You explode in anger, tell a whopper, eat the whole bag of cookies, or do something else you didn’t mean to do and will later regret. Maybe you yelled at a child, your partner, a stranger; or maybe you didn’t yell or lie, but you said or did something else you’re sorry for. Maybe you didn’t do or say anything, and you’re sorry about that. Something happened, and in spite of your best intentions, you crumpled. Courage? You changed the subject to avoid confrontation and left without doing or saying what you wanted, or following through to get it. Too often, you don’t say STOP, don’t demand respect, explain what you mean, or ask for what you want. You say yes when you want to say no, or you say no when you want to say yes. Or maybe you want to say yes, maybe, say more, but the best you can squeak out is a barely audible no, making you feel like a wimp, a fraud, or worse. Not doing what you intend is a habit. One of the most common habits in this category is procrastination. You have a big project due tomorrow. You’ve known about it for two months— sixty days of increasing, gut-twisting anguish. Every morning, you’ve put it off until it’s too late in the day to start. And now you’re facing an impossible deadline. You still haven’t begun; it’s still there to do, and there’s not enough time left to do it right. It can no longer be the masterpiece you imagined, and you won’t win the prize or recognition you fantasized. Or maybe it will cost you financially: you’ll owe the government more money because you delayed filing your taxes and didn’t have the time to find all of your deductions. You’ve suffered on the run-up and will suffer the consequences of the delay. For what? You could have produced something to be proud of instead of just getting by—and maybe this time you won’t even get by. Maybe you’ll get fired, or disappoint a colleague, or lose hard-earned money. There’s no one else to blame, and you feel bad. It’s not enough that you intended to do something different. What you said, or did, or thought contradicted your values, costing you real-life consequences and self-esteem. You realize you need to get this habit under control, or it will keep costing you dearly. Maybe a book will help. This book. Those habits I just mentioned produce regrettable, observable behavior. But we are also subject to habits that produce attitudes, thoughts, judgments, and moods that may or may not result in unwanted behavior, but whose mere appearance in our minds make us feel out of integrity with our values. They include letting moods cloud or distort perceptions and cause us to punish innocent bystanders, giving license to judgments and prejudices antithetical to our values. These habits of mind cause us to act and react differently than we would if not under the influence of the habits. When we’re frustrated or in a bad mood, we may say or do things in a tone of voice that we regret, or with aggression that is out of proportion and undeserved by its target. Situations that are positive or unremarkable might produce negative emotions. We might miss opportunities for joy and happiness. Prejudice and judgment can cause us to think and feel in ways that are inconsistent with our values. For example, humans are wired to be suspicious of strangers and people who are different from us: they’re “others.” We’re all influenced by social mores, even when we’re not explicitly aware or approving of them, so it’s not surprising that we find ourselves reacting negatively to people we don’t know just because of how they look, act, speak, or dress, without any knowledge or interest in what they’re really like. I feel bad when I catch myself judging someone because of his or her appearance. Having attitudes about people based solely on what I can see or hear violates my values about how I want to relate to people, so, for me, profiling and stereotypical reactions are unwanted habits. But I do have them, so I work at managing them to keep them from turning into behavior. Thoughts and attitudes that oppose our values are unwanted habits. We do not choose them, yet we experience them repeatedly. They appear automatically, swiftly, without warning, and without our participation, in the same way that we experience urges to physical action. You do these things, think the thoughts, and have the attitudes that betray your values not because you’re a bad person or otherwise of poor character. You do them because the combination of your genetics and experience from womb to the present moment has given you those automatic reactions—habitual reactions to things you encounter in your world. As noted in the Introduction, one purpose of this book is to show you that the automatic ways you react are not of your design, and to teach you how to manage impulses that produce unwanted results. All of them are emotional habits—impulses to act, as well as thoughts and attitudes that appear in your mind—powered by emotions your brain produces subconsciously and involuntarily. The emotions that accompany impulses are usually exactly what is called for in the situation, yet they’re often not what you would choose given time and perspective. Unwanted impulses produce our unwanted actions, thoughts, and attitudes. The challenge is to manage the unwanted impulses to keep them from turning into unwanted behavior, and to keep unwanted attitudes and thoughts from influencing us unintentionally. It is said that a gentleman is one who never insults someone unintentionally. There are times when anger or fear are essential for getting us to take the actions needed for survival. Most of our emotions, moods, and attitudes have a place in our toolkit, but we need to get out of automatic to use them intentionally and skillfully rather than mindlessly. I hope you’ll come to think of your unwanted habits as simply “unwanted,” not “bad.” Chances are that when I write unwanted habits, you think bad habits; it’s how we’re conditioned to think. Yet the word bad is unnecessary and gets in the way. There’s a tendency to think that if we have bad habits, then we are bad. Anything that causes us to think of ourselves as bad can produce guilt, shame, and denial, which keep us from recognizing and acknowledging what it is that we do. If we don’t acknowledge what we do, we can’t manage ourselves. Many people believe that calling something bad creates additional motivation for change. That may work for some, but that attitude may make the habit dig in and be more difficult to manage. Carl Jung is credited with the observation that “what you resist persists.” That has been my experience, so I’ll stick with unwanted. As mentioned in the Introduction, the Act from Choice Method you’ll learn in Part II will help you manage a wide variety of unwanted habits that are neither dangerous nor clinical in nature. They are “unwanted” simply because you don’t want them. Most of our habits are extremely helpful. They’re time saving; they help us avoid danger or take advantage of opportunities; and in most cases, they lead to behavior that is exactly what we’d consciously choose. There are three categories of habits that almost always cause more problems than what they’re reacting to. They are misdirected habits, misguided habits, and useless habits. Misdirected Habits are those in which the impulse the habit creates doesn’t address the stimulus that produced it. Something makes us feel bad, and we’re moved to eat, or drink to excess, or mistreat the dog. The reaction is misdirected because it does nothing to address what made us feel bad. Maybe the bad feelings go away temporarily, but since the reaction didn’t address its cause, the problem remains to be dealt with. Misguided Habits are those in which we have a significant reaction to something, but there is no objective reason to feel or behave the way the habit directs us to. These habits are caused by conditioning. Conditioning can cause the brain to interpret things incorrectly. Just as Pavlov’s dogs were conditioned to salivate when a bell rang, whether or not there was any food coming, something has caused us to mistakenly forecast that the stimulus will produce undesirable (or maybe desirable) consequences; we experience anger or terror, for example, even though the stimulus is harmless. My principal teacher, Tsoknyi Rinpoche, calls the way we feel and react when influenced by misguided habits “real but not true.”13 The feelings produced are very real; we feel under threat, the impulses and emotions are very powerful, but there is no true reason to feel that way. PTSD symptoms are perfect examples of misguided habits. A returned veteran is approached from behind in a supermarket in Minneapolis, and he reacts as if he were being ambushed on a street in the war theater where he served. An innocent remark by an old man produces the same feelings the adult felt as a child when rebuked by his father. My slogan when trying to cope with useless frustration or disappointment at situations I can’t change is “Don’t make things worse than they already are.” It’s bad enough to be stuck in traffic, much better to figure out how to adjust for being late; why pile more bad feelings onto the situation and feel worse, longer? All of us do things and have thoughts and attitudes that betray our values, not because we’re of poor character, but because our individual genetics and experiences, from womb to the present, have given us a set of automatic, habitual ways of reacting to our experiences. You didn’t choose those reactions; they just moved in and took up residence long ago. So now you find that when confronted with certain situations, you may experience unwanted impulses, hold undesired attitudes, or think or act in regrettable ways. And, unfortunately, these habits are stubborn. Even if you can override the impulses and restrain yourself from acting out, you can’t simply will the impulses away. In many cultures, simply feeling an impulse to violate cultural norms and moral imperatives is judged, in and of itself, to be a sign of low character, shameful at best, sinful at worst, even when you successfully interrupt the impulse and no untoward behavior results. This is a cruel judgment because most of our impulses are involuntary. They were programmed by the brain, automatically, at a very early age. That so-young brain was recording the way its genetically influenced traits reacted with its experiences. You never had a chance to vote or otherwise choose or influence your traits or the experiences you were subjected to, and at that age you didn’t have the wisdom to know how to choose, if given the opportunity. In his book Emotional Intelligence,20 Daniel Goleman tells us that many of our emotional habits are formed early in life, even before we have language. Those comments of his gave me my first understanding that we do not choose many of our regrettable reactions—that the impulses those emotional reactions produce are no cause for negative self-judgment. They’re simply what our individual brains innocently programmed us to do. Since many of our most troublesome, unwanted, automatic reactions were formed in response to situations not of our making, it’s no wonder our impulses don’t match our adult, values-driven intentions. The mismatch between those intentions and our preprogrammed reactions is what makes us judge the consequences of some habits, and the habits themselves, unwanted. Their existence is not under our direct control, and the fact that we get angry, envious, greedy, or inappropriately lustful is no reason for negative self-judgment, as long as we do our best to stop the impulses from turning into action. But make no mistake. While impulses don’t count, behavior does. Unwanted impulses will continue to arise, to be sure, but we can’t be let off the hook for our behavior. Unfortunately, some of us get so caught up in feeling guilty about the impulses that we go into denial that keeps us from acknowledging that we behave the way we do. Obviously, we will never be able to work on what we cannot acknowledge as fact. If you tend toward denial, I hope you will come to accept that your impulses do not reflect your character. If you can keep that in mind, it will help you manage your behavior regardless of what you think of your impulses. You’re not alone in having unwanted habits. In fact, you’re in very good company. How about the Apostle Paul? And the Dalai Lama? And billions of other humans living and not. Paul seems to be decrying his own behavior, later identifying the cause as “sin living within [him]” (verse 20). If Paul could not entirely control his impulses and felt out of control and “bad,” it’s not surprising that we react to our unwanted habits the same way. Paul had it right and wrong. He was right to acknowledge the behavior, but in my view he was understandably misguided in seeing it as inherently sinful—that is, a sign of immoral character. As you’ll see, it’s inevitable that humans experience inappropriate impulses. Your habits put you in good, if imperfect and struggling, company. The good news is that we are able to see our habits, acknowledge their existence, judge them inappropriate, and try to bring them under control. Rather than decry the unwanted impulses and blame yourself for them, take credit for your attempts to manage yourself and the effort you’re putting into being how you mean to be. In subsequent chapters, I’ll give you evidence to support my claim that we are innocent of our impulses. I hope that evidence will help you view your behavior, and more importantly, yourself, with understanding and compassion. Obviously, habits of action, thought, and attitude are common and durable, but stay with me and I’ll show you how to improve your ability to manage them. But first you need to know what you’re up against: how habits work, why they’re so durable, why yours are what they are, and what opportunities you have for managing them. These are the topics I present in the remainder of Part I. Habits are automatic. They don’t need you. That’s their nature and the source of their benefits and faults. They act whenever we call on them or when something triggers them. We choose to acquire some, for example how to serve a tennis ball, how to form our letters when we write, or how to drive a car. We acquire others unconsciously—how to walk, when and how to smile, what to do when frightened. The habits we’re working with in this book produce their impulses with no help from us. Indeed, they don’t want our help. They’re programmed to engage automatically. There’s no provision for them to be interrupted or otherwise interfered with. A stimulus appears. The brain notices immediately, interprets it, and triggers what Antonio Damasio, professor of neuroscience at the University of Southern California, calls an “emotional action program,” a reaction meant to deal with the stimulus or the consequences the brain has forecast (and may fear or desire).28 If it suspects the stimulus might be dangerous, the emotional action program impels us to fight, flee, or freeze. If it’s desirable—a reward or something else of apparent benefit—we’re moved to capture it. All of that happens automatically, even before we’re conscious of the stimulus’s presence. That’s right; the brain notices what’s going on, makes its decisions, and orders you to act before you’ve noticed there’s something to react to. It’s able to do this because in addition to conscious awareness, the brain has a faculty of unconscious awareness, which in some of the scientific literature is called perception without awareness.29 You’ll read a lot about this faculty in subsequent chapters. That the subconscious can do this without our involvement or awareness is entirely contrary to our lived experience, as I mentioned in the Introduction. We’re convinced that we see something, think about it however briefly, and decide what to do. We believe we consciously choose our reaction. But in fact our reactions are formulated and initiated subconsciously. And subconsciously means just that: out of sight of and inaccessible to awareness and conscious interference, as already discussed. The ability of the brain to do things, see and hear things, and make decisions we’re not aware of is one of the characteristics of human behavior that makes self-management and self-judgment so difficult. Ignorant of the role of the subconscious, we give ourselves too much credit for the good things we do and take too much blame for the failures. If you’re not already familiar with the many things the subconscious does without our help or knowledge, you’ll very likely be skeptical about what I’m saying, as I was when I started studying the neuropsychology of human behavior. I promise to give you a lot of evidence to support these statements. The brain’s automatically and subconsciously generated emotional action programs are key to our survival. The impulses they produce are a call to action—an impulse to act, accompanied by an emotion whose purpose is to motivate us to act on the impulse rather than resist it. The brain systems that produce them make complicated assessments of what’s going on and give us near-perfect emotional action programs for dealing with everything that comes our way. We literally could not survive without the impulses they produce. No matter how subtle they are, every change in our environment generates reactions that affect us, often producing an impulse to act. But the processes that create those impulses are not perfect. While the impulses are overwhelmingly accurate and appropriate, sometimes the processes that produce impulses to perform actions and generate attitudes and thoughts are inaccurate and inappropriate, and undermine our values and intentions. In addition, impulses give us no clues as to whether they’re appropriate and what we’d choose to do—even whether they should be trusted or questioned. Left on their own, without oversight, those impulses will turn into action. It’s our challenge and responsibility to identify the unwanted ones and interrupt them before they produce regrettable events. Figure 1 is a simple schematic of a habit. 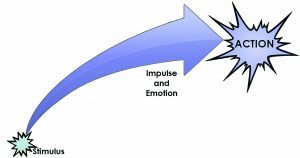 Something happens (a stimulus) causing the subconscious to start the process of reaction, and maybe a half- second later we experience an impulse to act and feelings we call emotions. Usually we do what the impulse and emotion want us to do, and that is the right thing to do. The subconscious constantly monitors and reacts to your external world as it communicates with you through your five senses. (Reactions triggered by thoughts, such as Maybe I didn’t lock the front door, travel different pathways in the brain. The impulses they produce are not as predictable and may not arise as immediately as they do when triggered by external stimuli.30) An external stimulus could be something desirable, pleasant, disgusting, or threatening. It could reach us through seeing or hearing something pleasant or threatening: smelling something unusual, such as smoke, and feeling the impulse to rush to the door, or smelling something enticing and experiencing the impulse (desire) to possess it. It could be hearing something we think is demeaning, producing anger and the impulse to lash out, or feeling something brush against us, causing the brain to forecast something pleasant or dangerous to follow and producing an impulse to act accordingly. The brain has a lot to do to get from stimulus to impulse, and it does it on its own, without your awareness or involvement. It interprets sensory input, decides what it means, forecasts its consequences, and initiates the emotional action program, which grabs control of the brain structures31 that set the body up to carry out the action part of the emotional action program, whether that’s to hit, scream, freeze, smile, kiss, boast, lie, eat, cheat, hide, or negotiate, for example. I can’t emphasize enough that everything from the sensory perception of the stimulus through production of the impulse and its associated feelings take place subconsciously and automatically. You’re not involved. You first realize that something is happening when you experience the feelings and impulse to act (or think) the way the emotional action program wants you to. The processing of sensory information that produces emotional action programs is separate and distinct from the brain pathways that produce the conscious experience of those senses. Your emotional brain sees before you do because the processing that takes place for your conscious benefit takes longer than what the emotional brain uses to make its decisions. For example, the feelings and accompanying urges of the emotional action program stimulated by an image become conscious before the brain has processed the image enough for us to be able to see itinanydetail. When the brain’s interpretation of the stimulus or its consequences is inaccurate, and/or when the action it prescribes is contrary to what you would choose in the circumstances, the impulses you feel will lead to unwanted actions or thoughts, unless you intervene. The emotion and urge to act are intertwined; you become caught up in finding the best way to carry out the impulse, even if the action is something you would not have chosen and will later regret.